Cartier introduced their Clé de Cartier model in 2015, an interesting concept in which the crown has been completely rethought to make pulling it out easier. Instead of the difficulty of using fingernails to pull out the usual circular crown, everything is made easier with the rectangular crown of the Clé watch. You simply turn it through 90 degrees so that the extremities project above and below the watch profile, and then it’s easy to grip. In addition, Cartier paid great attention to the experience of winding and time-setting, with a subtle clicking action that the user feels while performing the operations. This year Cartier have introduced a skeletonized version, with no dial, and bridges structured into the shape of the Roman numerals 3, 6, 9 and 12, along with straight bars for the other hour positions. 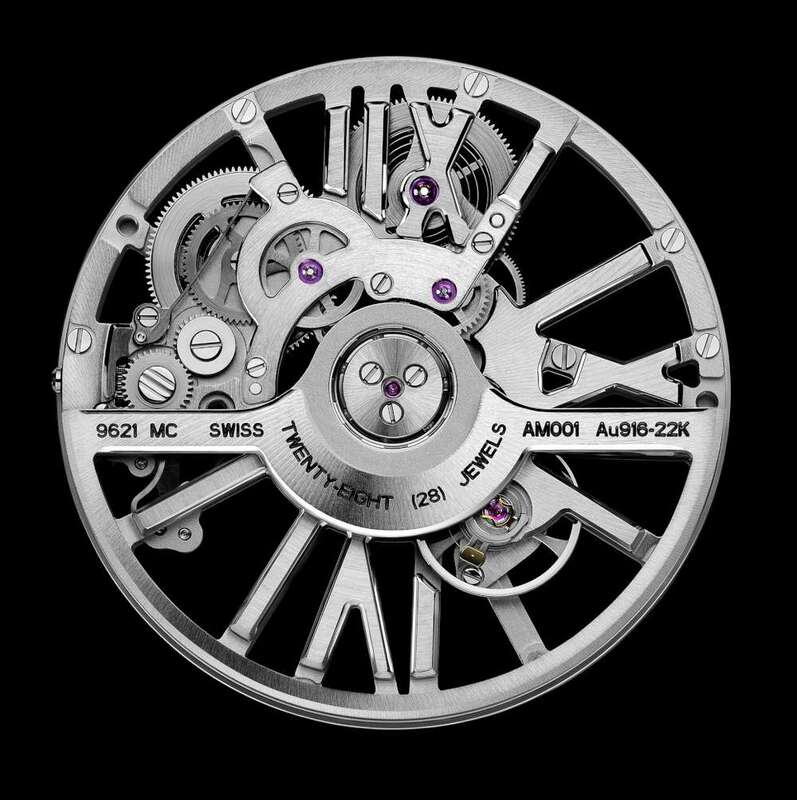 In many skeletonized watches by other brands, the bridges are skeletonized into abstract shapes which, though beautiful, have no narrative function. Cartier’s concept is simple and powerful: what’s left of the bridges after skeletonization becomes the hour indications. The decoration is also simple, a sort of circular brushing. The result is a watch that looks elemental, tough, a touch mysterious. You can see just about all the movement through the watchglass and caseback. The Clé de Cartier Automatic Skeleton is Cartier’s first skeleton watch to have an automatic movement. 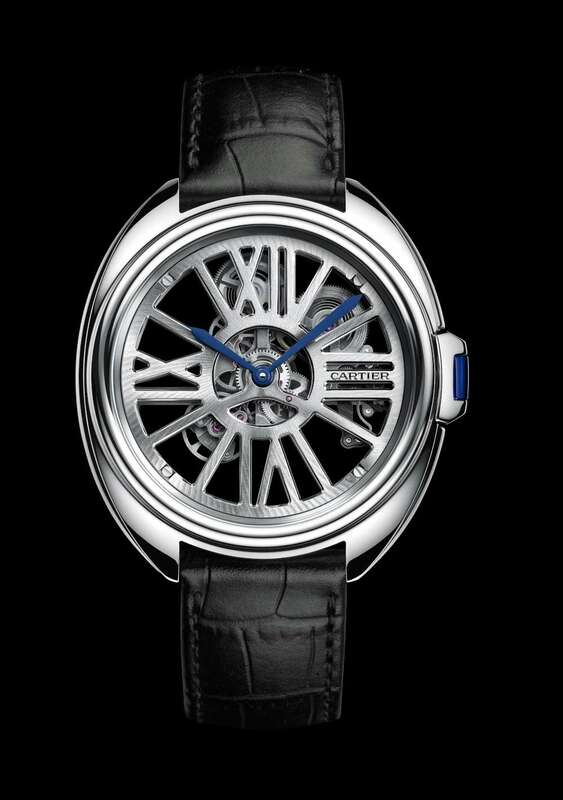 The calibre 9612 MC, designed and built in-house, was designed so that the oscillating weight does not obscure the view. 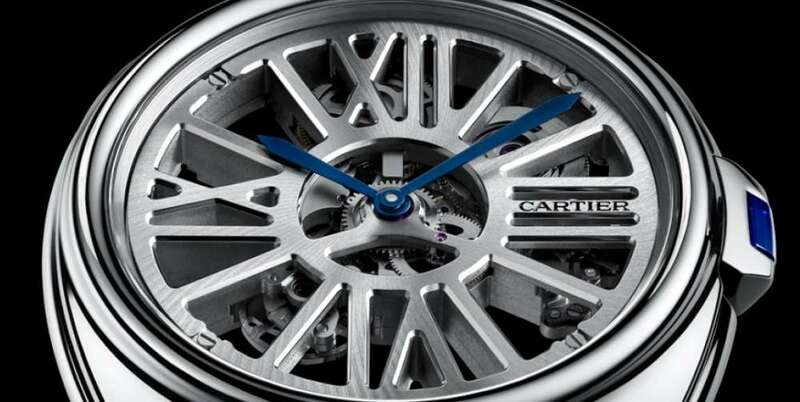 So the rotor is in 22-carat gold, with much of its weight concentrated in the narrow peripheral arc. The movement is 5.66 mm thick, and much of this depth is taken by the girder-like Roman numeral bridges whose thickness contributes a lot to the watch’s aesthetics. 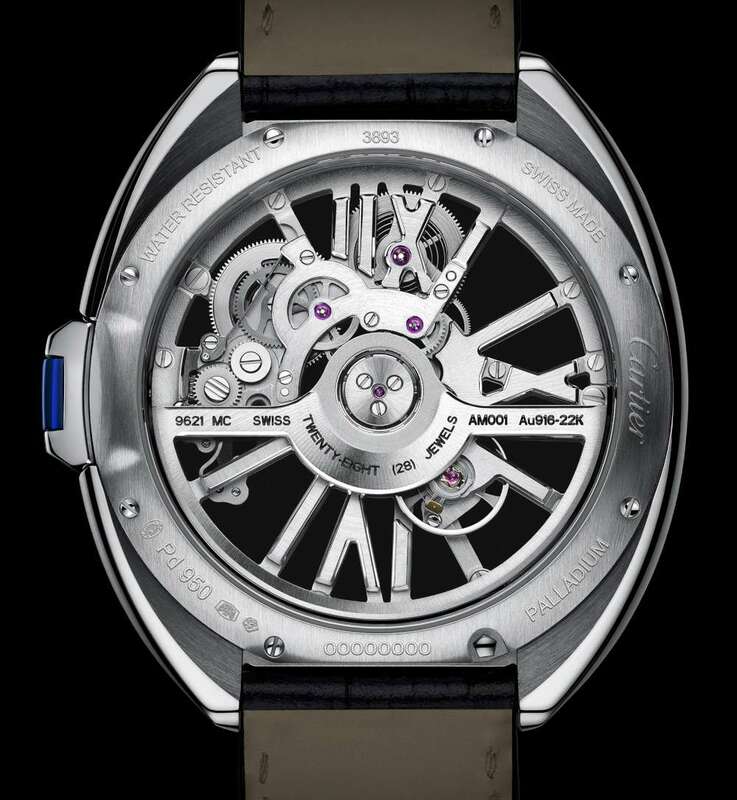 It runs at 28,800 vibrations per hour (4 Hertz) and provides a 48-hour power reserve. The case of the Clé de Cartier Automatic Skeleton is 41 mm across, in palladium, water resistance 3 bar (30 metres). 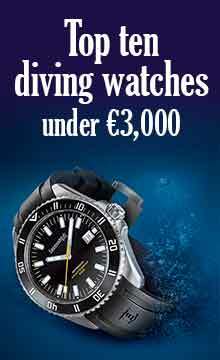 Blue accents are provided by the blued steel hands and the key set with a blue sapphire. The strap is in black alligator with a white folding buckle.